Knock on wood, I have never been the victim of a crime while travelling. I like to think it’s due to a combination of being aware of my surroundings, not wandering around alone after dark and of course, luck. That being said, there are a number of easy precautions you can take before you even head to the airport, that will greatly increase your chances of having a hassle-free trip—and coming home with all your belongings. Tourists stick out like a sore thumb. Staring at everything in wonder (or looking frantically confused/lost), whipping out the map, walking around with a huge camera—yeah, definitely an obvious target for thieves. Pickpockets abound in countries all around the world, and you’d be amazed at how quickly they can clean out a purse or backpack without you even noticing. That’s why the best way to ensure your important documents are kept safe is to put them in a money belt. Money belts are like a fanny pack but fit seamlessly under your clothes, so not only are they concealed but they’re also not terribly uncomfortable. Zip your passport, credit cards and cash inside, then slip it around your waist. The key here is to keep it under your clothes (yes, I’m guilty of that, so thought I’d mention it!). You can buy one at travel stores and airports, and it could be the best $15 you’ve ever spent. Side note: try to remember you are wearing it. My husband and I almost missed a cruise after his passport went missing. After a number of frantic phone calls and dumping out our suitcases on the dock, guess what turned up in the money belt he forgot he was wearing. Whew! This is perhaps one of the most brilliant pieces of travel advice I’ve ever heard of. It comes courtesy of Justin, the guy behind the travel blog True Nomads, who was the victim of a robbery at gunpoint while travelling on a bus from Ecuador to Peru. As he details in this post, as soon as he realized what was happening he hid his wallet, passport and camera–then handed over a fake wallet when the crooks came calling. Guess what was inside the old, weathered wallet he’d been hauling around? About $10 worth of $1 US bills, credit cards that were no longer active, a Safeway card and library card. We’ve all heard the horror stories about someone who gets something (read: drugs) slipped into their suitcase in some dodgy country, or pulls their bag off the conveyor belt to find their jewelry has been swiped. An easy way to prevent this is to buy a TSA approved safety lock for your baggage. 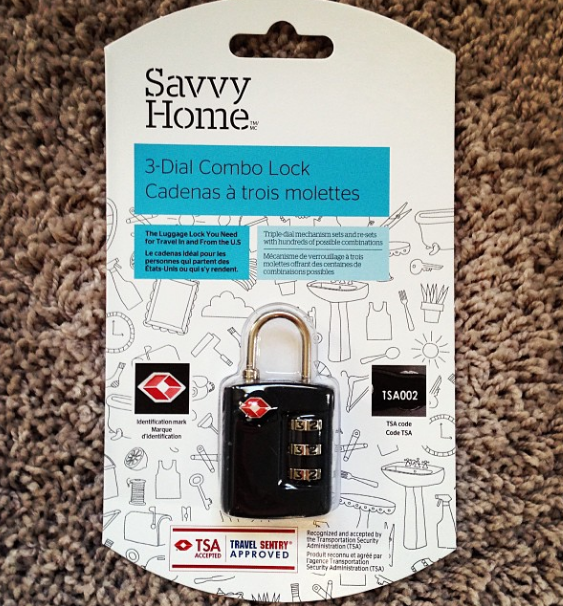 Available everywhere including drug stores, the combo locks will hopefully be enough to ward off unsavory folks, who will likely just move on to an unprotected bag. The key here is to make sure your lock is TSA approved, so that airport officials can get into it with a special code if required. A lock will only set you back about $10. Did your guy finally put a ring on it? Fantastic, but don’t bring your bling on vacation! Seriously, if you’re travelling to a sketchy place, wear a simple cubic zirconia ring instead, and leave the pricey gems at home. Toting around designer bags and thousand-dollar cameras makes you a huge target for thieves, so try to limit which pricey gadgets you bring along. Maybe you don’t need your iPad AND iPhone for the trip, or only pack one pair of your favourite earrings. Basically, leave behind anything you’d be heartbroken about if it never made it back home with you. This might seem obvious, but it’s amazing how many people get robbed while simply being distracted or too at ease. For example, pickpockets are notorious for doing crazy things like using a fake arm to hold a newspaper on the train, while their real arm searches through your valuables. Some work in groups, surrounding you while offering to help clean up a mess on your jacket (after they ‘accidentally’ spilled on you) while another goes through your pockets. In Paris, even children are becoming criminals, and are known to surround people at ATMs and hit the buttons, before the customer runs off not realizing more cash is still coming out. I have a friend who was stripped of his valuables in Spain, after a group of women surrounded him outside of a bar. Another woman I know had her camera stolen off the back of her chair in a restaurant in Peru. The easiest way to ward off these professional thieves is to be wary any time someone gets close to you, whenever you are on public transit, and to keep your valuables tucked under your clothes if possible. There is usually a direct correlation between how much you spent on your hotel room, and the likelihood of you getting robbed. That’s not to say you’re in for it if you book a $10/night hostel, but just be aware of your surroundings. Hostels are full of people coming and going in shared rooms, so it’s easy for your belongings to ‘walk away’ if you’re not careful. Lock your suitcase or take advantage of a locker if one is available, to store your stuff in while you’re out and about. Of course, thefts can happen anywhere including five star hotels, so be sure to use the in-room safe. Also, don’t leave your stuff lying around all over the hotel room. Have you ever been robbed on the road? Do you have a great way to keep your stuff safe while travelling? Comment below, or tweet me! We’ve been robbed twice on our trip – both times, it was Sam and not me who got robbed. The first time, we were at Barranquilla carnival walking through the crowd, and Sam’s phone got lifted from his jeans pocket. We had all our valuables in my anti-theft bag, but forget about his phone, so it was our own fault. At carneval, everyone has canisters of foam which they shoot everywhere, and someone sprayed it in Sam’s eyes then pickpocketed him while he wiped his face. It’s a common tactic, we know about 6 people that had the same thing happen to him! The second time, we were on a night bus and asleep with our bags on the floor under our legs. Someone slid Sam’s bag out without waking him up, and took his tablet out of it. Now, we keep all our valuables in one bag and have that on the floor next to the window, and we keep it padlocked shut. Still, you can never be totally safe when you sleep on buses I think – any tips would be appreciated! Oh my goodness, what horrible luck! It just shows that even when you’re taking precautions, these trained thieves still have some sneaky tactics. That’s a good idea to put a lock on your bag–I do that with my suitcases too! 99% sure took it, but then I thought what if she has a knife? Besides she probably passed it off to someone else already. They work in groups, but act like they don’t know each other. We always split up our money, but unfortunately didn’t that morning. Out $500. Should have taken the $10 cab. OMG! So sorry to hear that!! Spain is quite notorious for that, I remember basically throwing myself over all of my possessions anytime we were in a crowded place, to try and keep them safe. I experienced a couple of pickpocket attempts but thankfully none were successful ! After having my shirt lifted up at the waist as someone looked for my money belt made me rethink the whole money belt thing. It is unfortunate we have to worry about theft but it is a reality of travelling, and I am not about to stay home because of it. Being prepared is the best offence . For women I highly recommend bravebetty travel bra. Passport, credit cards, cash all fit on the inside of the racerback. Perfect for overnight bus trips – I don’t think a thief can get inside your shirt and then your bra without you being aware of it! Wow that’s so scary that someone would go as far as to lift up your shirt to look for the money belt!